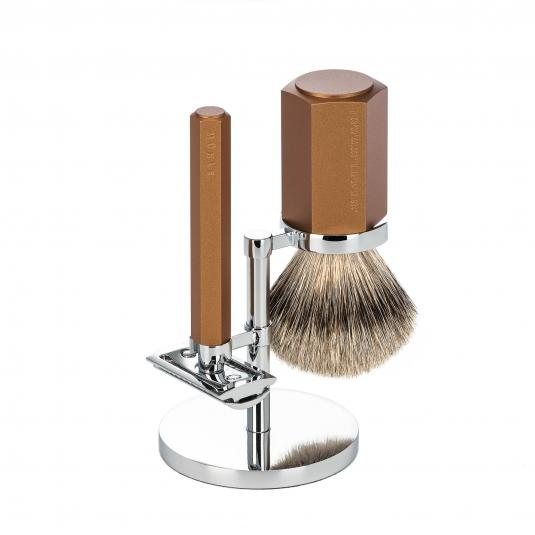 Edwards traditional shaving emporium are proud to present the Muhle Hexagon 3pc shaving Set Bronze silver tip fiber. The hexagon shaped barrel of the safety razor and the shaving brush makes this peice so original. The set has shades of the Bauhaus movement in it’s design. It Is also stamped with the Muhle factories coordinates, giving the set a Military vibe. 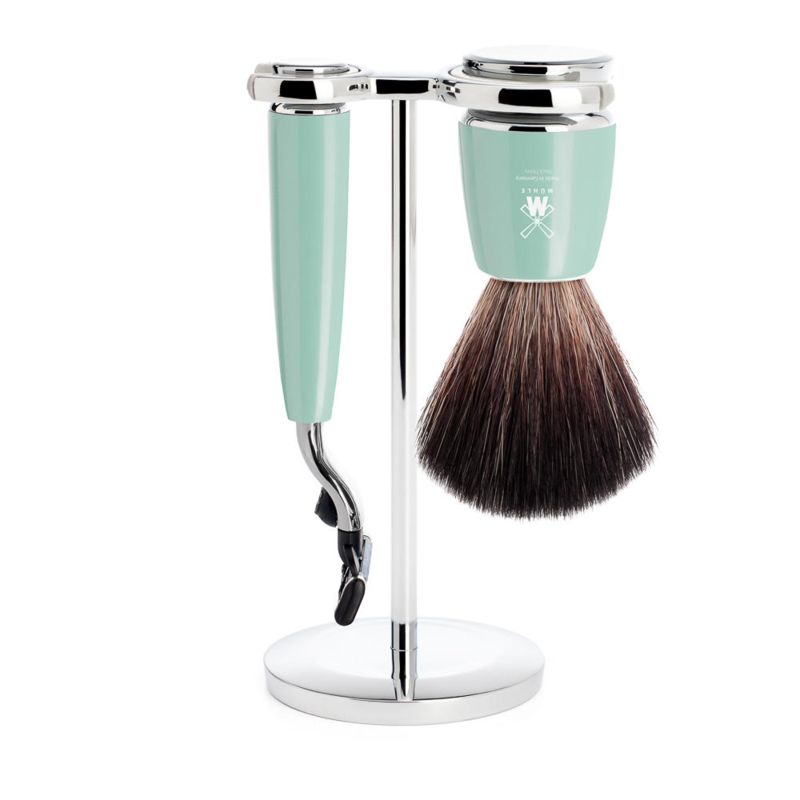 The razor itself has a plated chrome closed head, which gives a close but safe shave. Making the razor middle on the aggressive scale. It is also 3 peice which means the Double edged blade will sit soundly clamped. The razor weighs 67 g which Is slightly heavier than the Muhle R 89 for your reference. The razor is 94 mm In length. 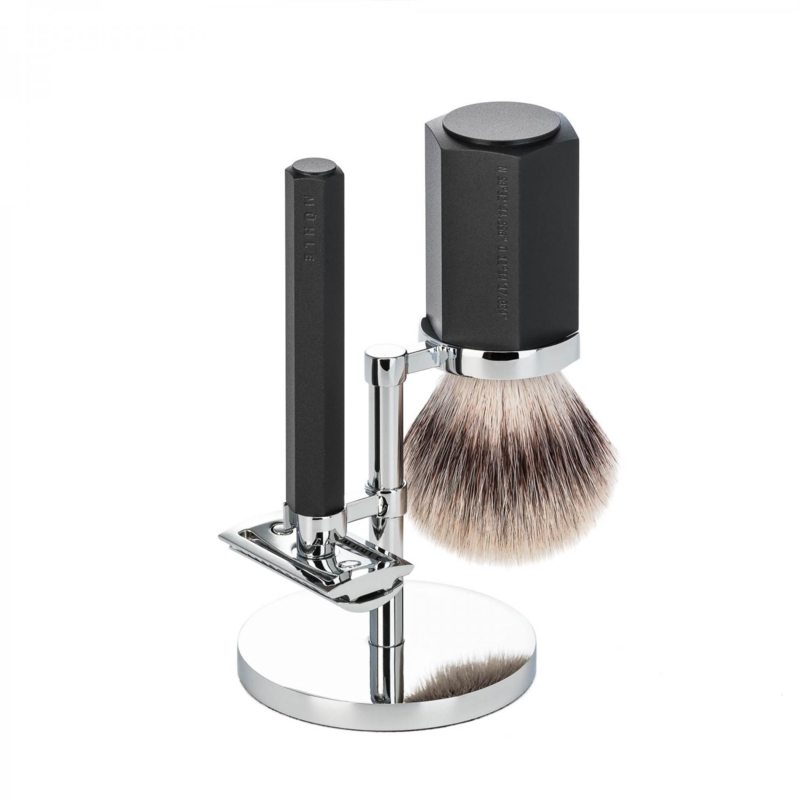 The shaving brush Is weighty at 127 g the height Is 108 mm, with a standard 21 mm ring. But the knot is not badger. It Is a replaceable synthetic fiber knot, that perfectly replicates the animals fur. The stand Is handmade of stainless steel at the Muhle factory, and Is a work of art in it’s own right. At Edwards traditional shaving emporium. We have a great deal of shaving info on our blog so why not have a look at which. Also an alternative too this is you can contact us directly with any questions you may have regarding the set. Free U.K. delivery on the Muhle Hexagon 3PC shaving Set Bronze silver tip fiber and Internationally for £8.50. This is a ground breaking set from the top dogs at Muhle. Mark Braun the Berlin based designer toiled away at his studio to come up with this innovative design. He has an impressive portfolio of designer watches and home ware so Muhle were very keen to get him on board. This is trully an exciting range which we highly prize.